A PhD is a huge undertaking that can sometimes seem all-consuming, however many PhD students are juggling their research with family life. 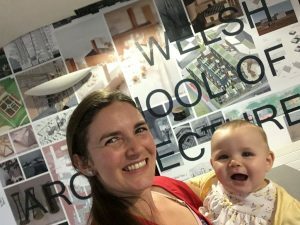 On International Day of Families, Diana Waldron (PhD Student in the Welsh School of Architecture) shares her story. My partner and I had started to get ourselves and our lives ready to plan a family after I had finished my PhD. We’d heard that getting pregnant could take a long time, so we didn’t worry too much. Since I was ready to start the second year of my PhD soon, we thought we could take it easy for two more years and then work hard towards having our family. However it seems the universe was only too keen to grant our wish, and I gave birth to a beautiful baby girl right in the middle of the second year of my PhD. This was a little sooner than we expected and I knew it was going to be a big challenge. However, in the process of trying to see the positive side of everything, I thought that it might be better to have the baby during my PhD rather than afterwards, due to the flexibility of time that this could offer. I am not sure that I am the best person to provide advice on how to handle a situation like this, since most of the time I feel I am just running on survival-mode autopilot. However, my best advice is to take one day at a time, deal with the most important issues at hand, have a relatively flexible plan, but set some unmovable milestones to help you reach your important PhD deadlines. I am not entirely sure I will succeed yet – my baby is now 16 months old and I still have about 1.5 years to finish my PhD, so this story is to be continued. But I am certainly doing the best I can to juggle everything, and I am determined that I will go to my graduation ceremony proudly holding my baby’s and my partner’s hand.